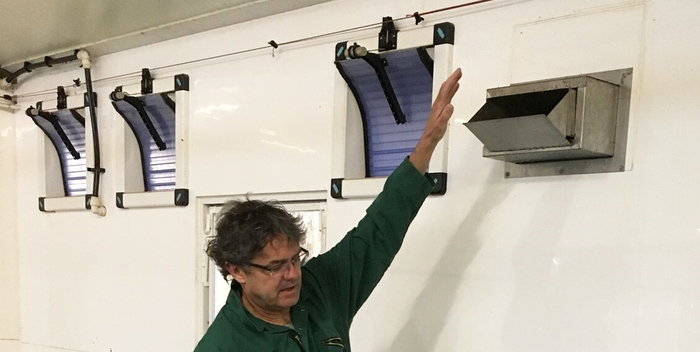 “Despite the thaw a common problem is farmers or stock-people setting their ventilation rates too high or too low,” said Tim Miller of Staffordshire-based ARM Buildings, who has been called out to advise on ventilation issues on all types of buildings over the past few weeks. “One farmer, thinking he was doing the right thing, manually over-rode the fan controls and set the minimum fan speed at 40 per cent, instead of lowering it, resulting in a very cold farrowing house,” he said. Normally, in the winter, minimum ventilation rates should be between five and ten per cent of maximum speed to keep air quality up, while ensuring the house isn’t over-cooled. Another problem can be setting the minimum ventilation rate too high, especially in the weaner-grower pens, where heat is provided. This simply results in expensive energy being wasted. “Modern buildings are extremely well-insulated so getting ventilation control rates correct is crucial,” said Tim. “Apart from when they are first filled, well stocked finishing houses are easier to keep warm even in severe weather so it is important to ensure the inlets are calibrated correctly and not open too much.” However, at this time of year it is often worth putting in a space heater to avoid a temperature shock to the young pigs when they are first introduced, he advises. A benefit in houses which are monitored by sensory equipment is that ventilation problems can be picked up much quicker as temperature and fans speeds are recorded continuously for analysis on line, he pointed out.